Needing an alternative to the norm this year? Trying to think outside of the (heart-shaped) box? 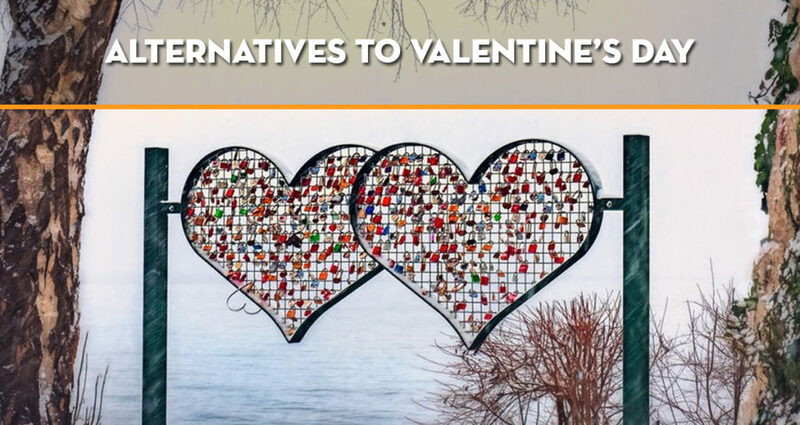 We thought we would round up some alternatives to Valentine’s Day, whether you’re lovers, friends, colleagues or rolling solo this V day. In Columbia, locals celebrate not only love but friendship as well. September 20th is their “Day of love and friendship” – not just for those in a pair but also friends and singles alike. There are mass dinners and parties where friends come together for some epic partying, a form of ‘secret Santa turns secret admirer’ where colleagues and friends exchange surprise gifts, and clubs restaurants and shops fill with hearts! The Chinese celebrate love a little differently too. Known as “Double Seven Day” or “Qixi” this day tells a story of two star-crossed lovers, a farmer and a fairy, who are separated by the Milky Way. There are lots of traditions that go along with this celebration of love but these days they also partake in group activities such as kissing competitions, underwater kissing shows and mass weddings (of course). Here’s something a bit different! The Welsh celebrate the story of Saint Dwynwen, the patron saint of lovers. While the actual story is… a little depressing, today the locals still celebrate the tradition a little more light heartedly by carving a ‘lovespoon’ to present to their beloved. Best start now, this is probably not a skill you learn overnight! Italy. Possibly the most loved up nation in the world and home to Shakespeare’s famous star-crossed lovers, you need not go farther if you are a bit of a hopeless romantic. Verona in Love is a four-day festival celebrating, well, love. There’s heart shaped lanterns, love-letter competitions and other massive events. So if you and your loved one are all for romance then Italy may be the place for you. Jumping over to France now where you’ll find both the celebration of love but also pay homage to those going Valentine’s Day alone. Traditionally, the holiday is marked with an event called “drawing for love” which essentially is like a bad recollection of high school where you get called on last in team selections. However; single girls got their revenge by holding a mass bonfire where they would burn photos of potential partners that may have wronged them. Yeesh!